In March 1945, Jack Sue was part of a 7 man team of highly trained Australian Special Forces of ww2 that was secretly inserted into Japanese occupied Borneo by the United States submarine USS Tuna. They were just 7 Z men amongst an estimated 3000 Japanese troops. They were highly trained members of Z Special Unit (more popularly known as Z Special Force). They lived and survived up close and personal to the indigenous blow pipe tribes within the depth and darkness of Borneo’s jungles; in the land below the wind and home to the wild man from Borneo. It was a place where ‘time’ didn’t exist. They trailed sections of the infamous Sandakan death march routes to Ranau and were forced to witness some of Japan’s worst atrocities committed upon Australian prisoners of war. For 6 months or more, Z men trained local guerilla forces and led a series of successful attacks upon enemy garrisons. They lived on their nerves with little sleep for long periods. They suffered tropical illnesses of all kind. They risked enormous odds of being turned in to the Japanese by locals and double agents. The penalty if caught was often very swift and brutal by Samurai sword. Following the surrender of Japan and in 1950, Jack Sue was awarded Australia’s 2nd highest award, the Distinguished Conduct Medal for his cold hearted bravery behind Japanese lines. 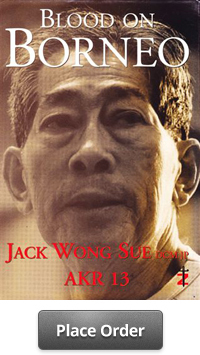 Blood on Borneo by Jack Sue is a collection of his war memoirs of 1945. Jack’s style of writing together with his deep love of nature became an instant winner for female readers. Unexpectedly, the first print of 2500 books sold out in 5 days. It’s an Australian bestseller that keeps selling. “ Blood on Borneo” is a terrific read, because it is not only about brave men doing brave things, it is also full of delightful human interest stories, including a number of those courageous local people, Malay and Chinese, who supported Z Special Unit at huge risk to themselves, where retribution if caught was swift, brutal and often final. It is a book that displays the young Sergeant Sue’s deep love of nature in the vivid descriptions of Borneo flora, fauna and undersea life. The author is a man of many parts; a former merchant seaman, an accomplished underwater diver, a decorated war veteran, a businessman, a musician with his own dance band, a family man and an astute observer of the human condition and the environment in which we all live. The anecdotal stories of his book, because that is what they are, written from the rough notes of a hastily scribbled war-time diary and aided by a phenomenal memory, make absorbing reading for all Australian teenagers and above, and I congratulate Jack on telling us so vividly and so interestingly about a special breed of Z men who played a unique and largely unsung role in the final defeat of a brutal but courageous enemy. Blood on Borneo is not only a great read; it also makes an excellent gift. Order your copy today and have it delivered to your front door.